What is Fundamental Analysis or "News Trading"? 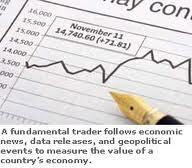 Fundamental trading is also known as news trading. It involves taking a position on a currency asset based on the news numbers that are released to the market, following a timetable set out by the economic news calendar. How does news trading work? At periodic times of the month, over a period of a year, certain economic and political data are released to the public as a guide to help gauge the economic and political well-being of a country. These data give an indication as to the state of a country’s economy, define the flow of domestic and foreign investments and also serve as a barometer of measuring the performance of key sectors of a country’s economy. These data will ultimately affect a country’s policy direction and affect the flow of investment and trade. That is why these market data are watched very keenly by investors. Due to the globalized nature of the world economy, it is now possible for an economic event that occurs in the US to affect 90% of the world’s countries. As such, fundamental analysis is such an important aspect of currency trading that every forex trader who truly desires to make money in the market cannot ignore news trading. Many times, we encounter traders who say that they only trade technicals and avoid trading the news. This is just wishful thinking because the markets will pay more attention to a drop in employment in a key economy like the US or UK and not to whether the currencies of these countries have formed a double top or a rising wedge. News releases are classified into three depending on the impact they have on the markets. a) High-impact news produce the greatest market volatility. This is because of the status that they assume in the markets, prompting interest from over 99% of forex traders from all over the world. b) Moderate-impact news releases are also important because while they do not move the markets as much as the high-impact news items, a moderate impact news event can easily transit into the high-impact news category depending on the market conditions. For instance, data about the US housing market were in this category prior to 2005, but when the global financial crisis was precipitated by problems in this sector, housing data immediately assumed high-impact status. Another example is the GDP data of selected European countries such as Spain, which have assumed high-impact status in the last few months as a result of the Eurozone sovereign debt crisis. c) Low-impact news data do not move the market and should be ignored. What news data are classified as high-impact market data? 2) Employment Data: the US Non-Farm Payrolls + Unemployment Rate data tops the global list. Employment data from the UK, Canada, Australia and New Zealand are also very important. 3) Gross Domestic Product (GDP). 4) Retail Sales: Retail sales are an indicator of consumer spending, which in effect rubs off on retail business, manufacturing and the nation’s GDP. 5) Consumer sentiment data: Also reflect consumer spending patterns for the reasons outlined for (4) above. 6) Trade Balance: A measure of the balance between a country’s imports and exports over a period of time. The net result could be either a surplus (exports > imports) or a trade deficit (imports > exports). Some other news data may be more country-specific. An example is the Asset Purchase/Quantitative Easing Program of the Bank of England which is a measure of the amount of money to be created and used for asset purchases (such as bonds) in the open market by the UK central bank as a means of curtailing long term interest rates. a) Consensus/Expected Number: Before a news release, a poll of leading economists is conducted to get their forecast on what the release number will be. This is also known as the forecast number. b) Actual Number: This is the actual number that is released to the market. c) Revision: This caters for occasional revisions to previous numbers to reflect uncaptured data at the time of the previous release. The most important parameter to watch out for is the deviation, which is a measure of the difference between the forecast and the actual number. In order to derive an acceptable deviation to use as a benchmark, the trader should work out the difference between the previous number and the forecast. For instance, if the GDP of a country came in at – 0.2% and the forecast is 0.1%, the deviation is 0.1 – (- 0.2) = +0.3%. What this means is that the trader should only take a trade if the actual number is > or = 0.4%, (usually a long position on the currency of the affected country) and < or = – 0.5% (usually a short position on the affected currency. As a general principle, wider deviations lead to heftier market moves. If the difference between the actual number and the forecast number is less than the deviation, there will not be enough volatility to produce a trading opportunity. The deviation is a parameter that most traders do not know how to calculate; it has now been explained here. With this information, traders who were ignorant of these moves are now appropriately positioned to benefit from fundamental trading.